After 24 years at Rollins, award-winning epidemiology professor, David Kleinbaum, PhD is hanging up his Hawaiian-style shirts and heading into retirement. An influential faculty member at Rollins since 1993, Kleinbaum has been a popular professor who filled his classes with humor. "When I started teaching mandatory biostatistics classes in 1970 at UNC, I realized early on that a lot of my students didn't want to take a course they perceived as boring, so I kept things relaxed and fun," Kleinbaum says of his active teaching methods. Over his 48-year teaching career, Kleinbaum achieved this by embracing technological advancements in the classroom, wearing loud shirts and peppering lectures with his signature brand of dry humor. "Several of my colleagues and students have referred to me as the Woody Allen of epidemiology," he says. Like Allen, Kleinbaum was born and raised in Brooklyn, N.Y. From the time he was a boy, Kleinbaum gravitated toward teaching, and schooled the kids on his block on the finer points of card-playing, checkers and chess, as well as schoolyard sports like stickball and three-on-three basketball. Later, after receiving his bachelor's and master's in mathematics and his PhD in mathematical statistics, Kleinbaum found himself teaching an introductory statistics class to public health students at the University of North Carolina at Chapel Hill, which is where he developed his signature teaching style. "David is renowned all over the world for his effective teaching of advanced epidemiology," says James W. Curran, dean of the Rollins School of Public Health. "He is an articulate spokesperson who can make people understand difficult concepts and enjoy doing so. Thousands of students have benefited from his teaching and from his books. We are so fortunate to have had him here for our faculty and our students for 24 years." As Kleinbaum began to come into his own in the classroom, he also started to make his mark in the publishing world. His first textbook, Applied Regression Analysis and Other Multivariable Methods (1978) was the first second-level statistics book aimed at public health students who were not biostatistics majors. That book was followed by Epidemiologic Research: Principles and Quantitative Methods (1982), which was the first textbook for the general scientist community to focus on modern epidemiologic research. He has written seven titles since those early days—several of which are on their third or fourth editions—and has had his books translated into several languages. Like his lectures, his books speak directly to the learner and explain complicated concepts in easy-to-understand language, often with accompanying visual aids. 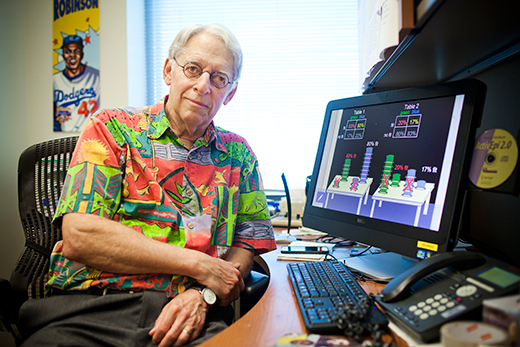 Kleinbaum's proudest achievement, ActivEpi, incorporated decades of his introductory epidemiology course materials into an interactive CD-ROM format. In 2015, to update the tool with modern technology, Kleinbaum adapted the product for the web and it's now available for free download as ActivEpi Web—to date, 8,000 users from more than 100 countries have signed up for the free website. As his long-time colleague and friend, Richard Levinson, executive associate dean for academic affairs, puts it, Kleinbaum leaves a lasting impression. "He's one of a kind. Generations of students have been dazzled by his classroom teaching—not to mention his collection of garish shirts—just as audiences have been delighted by his riffs on the flute in his jazz band performances [like Woody Allen, Kleinbaum also moonlights as a musician]. We have been so fortunate to have him as a colleague and teacher for over two decades." Curran adds, "He embodies the joy of teaching. He helps his students realize that obtaining public health skills can be fun." For Kleinbaum, active learning is at the heart of effective teaching. Using this philosophy as a guiding principle, Kleinbaum has always prided himself on his carefully prepared lectures and other course materials he made available to students before and after class. In the days of chalk and blackboards, Kleinbaum always provided paper handouts for his students so they could follow the lecture without having to spend time copying from the blackboard. Later (way before the days of PowerPoint), he prepared his lecture materials using overhead transparencies and, for many years, he used two overhead projectors with two screens in his lectures. After moving to Emory, Kleinbaum utilized Emory's internal-facing online Face-book tool to create flashcards for memorizing all of his students' names and faces before the start of class—even for those classes that held 150 students. ("I almost treated it like I was preparing for an exam," he says). Over the years, Kleinbaum has taught thousands of learners worldwide through his textbooks, his on-campus courses, and through more than 200 short-courses around the globe. A longstanding advocate for the advancement of teaching, Kleinbaum established the David G. Kleinbaum Fund for Teaching Excellence in Epidemiology to fund the next generation of epidemiology professors specializing in quantitative methods issues. Kleinbaum is internationally recognized for his teaching and has won several of the most prestigious awards offered to public health educators. He won the very first Pfizer/ASPH National Award for Teaching Excellence in 2005, was named an elected fellow of the American Statistical Association and has won both the Rollins Teacher of the Year Award and the Emory Williams Distinguished Teacher Award, among numerous additional honors. Though, Kleinbaum notes he received his greatest award a few months ago, when he learned a professor in Uganda—a stranger who is a fan of Kleinbaum's textbooks—named his son David Kleinbaum Migisha. "It doesn't get much better than that," he says. Given Kleinbaum's go-getter attitude, it's unlikely he'll retire to a life of leisure. While he claims he has no immediate plans, Kleinbaum mentions he's interested in finding ways he can further introduce ActivEpi into the general high school curriculum. He's also hoping to teach himself piano; play more music with his band Moonlighters Jazz Band as well as with other musicians; and to learn more from travel, current and new friendships, and reading about the complex world in which we live.